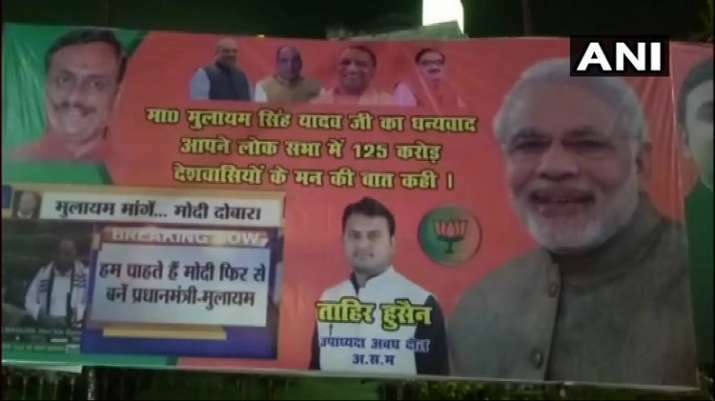 Posters thanking Samajwadi Party patriarch Mulayam Singh Yadav for saying that he hopes to see Prime Minister Narendra Modi back in power were seen in Lucknow on Wednesday. "Thank you Mulayam Singh Yadav, today you reiterated the wish of 125 crore Indians in the Lok Sabha," one poster read. In a surprising statement on Wednesday, Mulayam Singh Yadav in the Lok Sabha said that he wished to see Prime Minister Modi back in power after the general elections this year.